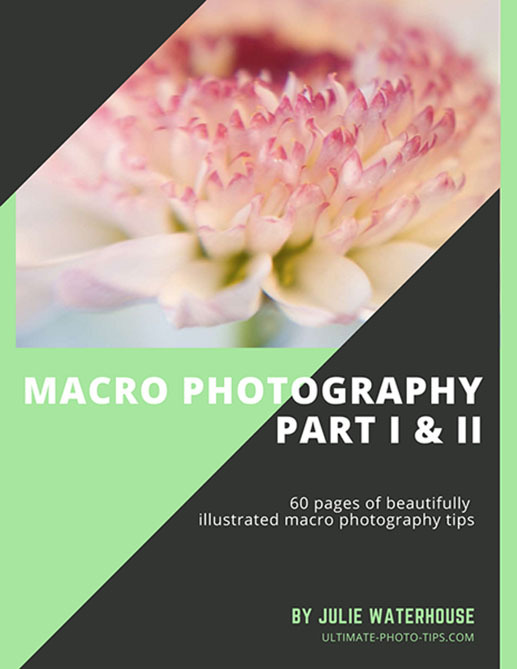 Macro Photography is a 60-page, downloadable PDF eBook full of helpful tips, useful information, and spectacular, full color images to inspire you to create better close up photographs. I talk about all the basic equipment involved in close up photography, from lenses to extension tubes to diopters. One of the biggest challenges of close up photography is having extremely limited depth of field. I discuss depth of field in detail, including how to select the aperture appropriate to the situation. Just because you’re close up doesn’t mean you can forget the rules of composition! I also discuss background choice, and the necessity of eliminating distractions. I include some nuggets on lighting, working with nature, and overall workflow. I have been speaking and giving workshops on close up photography for years, and finally decided it was time to put pen to paper (well, fingers to keyboard, anyway!) to share my experience and love of macro photography with you. Have you ever struggled to get the close up images you want? Close up photography differs from traditional photography in a number of key ways. Through my workshops, I’ve seen people struggle because they are not expecting these differences, and are unsure how to handle them, or unaware of them altogether. In these eBooks, I attempt to unlock the mysteries of the macro world, with clear descriptions and illustrative images. No more wondering how it’s done! I’ll share expert macro photography tips and tricks that will fix the problems you’ve been experiencing. Do you want to take better closeup photographs? I want to help you to start taking pictures that will give you a sense of pride and accomplishment; pictures that will “wow” your friends, and that you’d be happy to hang on your wall. Learn from the informative content in these eBooks, and be inspired by the beautiful and creative images.